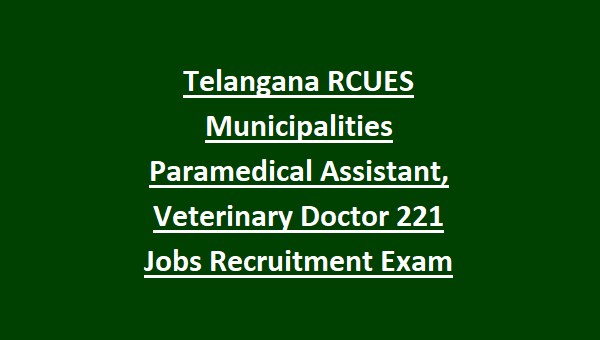 Paramedical Assistant posts are available in this Telangana RCUES Recruitment 2018 of Urban Local Bodies (Municipalities). Eligible candidates can apply online for this Telangana RCUES Veterinary Doctor and Paramedical Assistant Jobs through rcueshyd.gov.in website on or before 11-08-2018. Candidates selection is based on written exam for this Telangana Urban Local Bodies recruitment 2018. These vacancies are only for the Municipalities of Telangana State. 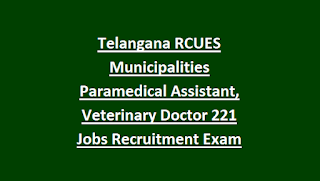 For more details regarding this Telangana RCUES Recruitment of Veterinary Doctor and Paramedical Assistant jobs selection process, Exam Pattern, Exam Syllabus, age limits, pay scale and other information is given below. State Nodal Officer: 01 Post. For State Nodal Officer-There is no upper limit. For Veterinary Doctor-Upper age limit is 64 years. For Paramedical Assistant-Upper age limit is 40 years. Paramedical Assistant RCUES: Diploma or vocational certificate in Animal Husbandry /Veterinary Sciences. Candidates selection for these Telangana Urban Local Bodies vacancies is based on written exam only. Based on candidates marks in written exam final merit list will be prepared. For both the posts written exam will be conducted for 100 Marks. Apply online for this Telangana Regional Center for Urban and Environmental Studies Jobs Recruitment of Veterinary Doctor, Paramedical Assistant Posts. Online applications submission last date is 11-08-2018 through official website of Telangana RCUES @ www.rcueshyd.gov.in.